With Martin's knowledge, dedication, and passion for coaching athletes, I am convinced he could improve the abilities of any Surfer. Martin emphasises technique as one of the most crucial components in surfing, which I believe has lead numerous competitive surfers to highly successful careers. I was coached by Martin throughout my professional surfing career and I have also had the privilege of coaching along side Martin. Coaching some the world's best male and female Surfers with Martin, I have seen first hand the progression and results that come from his coaching techniques. Martin has been the principal coach of both Nikki and Joe van Dijk. We have no doubt that without his input they would not have attained the successes they have achieved. Martin possesses a comprehensive understanding of the developmental stages and strategies to improve surfing technique for surfers of all abilities and levels. His experience at diagnosing the physiological function of the surfer, corrective techniques and practises for progression are systematic and successful. The key area of achievement in Martin’s repertoire is his communication skills. He is personable, clear , succinct, and non judgemental. He has the ability to elicit the optimal responses from his students. Martin is a surf coach of integrity with the highest professional standards. Martin ticks all the boxes: he has the theory, the tools, the experience, the results, the personality and the commitment to ensure you improve. I and my three sons have worked with Martin for over ten years because Martin kept delivering feedback, plans and support that made a real difference. You will not find a better all round coach. Throughout my time as High Performance Coach at Surfing Victoria and working with the Australian Junior Team I have consistently sent Martin video footage of the promising surfers I am working with. This has been not only a learning curve for my surfers but a huge learning curve for myself as a coach. The chance for me to get instant feedback from Martin on a weekly/monthly basis kept my surfers and my coaching skills on the pulse of what was happening word wide. I'm a better coach by having access to Martin and the knowledge he is willing to share. Thanks so much for your support especially of the SA kids who have loved you visiting them over the years you have been involved. Longy, Squizzy & I have also appreciated your mentoring. 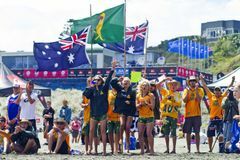 I think the resources you have produced for Surfing Australia have been ground breaking & are resources that will support coaches for 20+ years or more. I personally use them constantly & the SA surfers have got used to the concepts. The work Martin put into our kids over the years has been essential in lifting their skills and aspirations. Importantly his motivation and wisdom has been vital in establishing a development structure for Surfing Tasmania .For Surfing Tasmania officials, coaches and myself, I offer our thanks for your friendship and leadership. I just wanted to personally and sincerely thank you for what you have done for the development of the sport here in this country. I myself, along with many others have been so privileged to be at the receiving end of your knowledge, experience and expertise. I have known Martin Dunn for a very long time, at least 20 years. We have worked together coaching kids, taken Australian teams internationally to compete at ISA World Games together and I’ve had the chance to see first hand what he is capable of and I have always been impressed. Martin is an extremely qualified and skillful coach and has more experience in the field than anyone that I can think of. 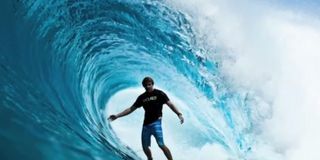 He is conscientious and hard working at all times, very organized and professional in his execution and he has helped many many people to become better surfers over the years. Martin’s time at the Surfing Australia Hurley High Performance Centre has been an invaluable contribution to Australia’s competitive future and Martin’s work in the area of correct technique and body positioning has become an international standard. I have always enjoyed working with Martin because we both share a passion for the sport of surfing and a desire to see its participants evolve to the highest level and we love it. 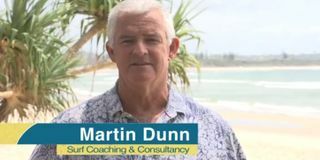 On many occasions I have had the need to call upon the expertise of Martin Dunn for support and advice when working with both high performing and developing surfers. As a coach of surfers for over 20 years I consider Martin to be the leader in the field of surf coaching. One of his strengths is his analysis of individual surfing technique and his knowledge of the Biomechanics involved in performing surf manoeuvres. His ability to deliver such analysis with the use of technology to surfers across the globe is a bonus for any surf coach or surfer. I will continue to utilise Martin’s expertise and will always refer my clients to do the same.